No refund for cancellations on large parties of 8 and more. If the payment is not received with in the allocated time. The booking will be cancelled. Key deposit of $200 pesos required upon arrival. Surf camps, Festival crews and government employees. We built 3 tier bunk beds with luxury mattresses so that we could house volunteers for local projects, we are not driven by money. Our drive comes from the community we desire to serve. Please keep in mind when you book to stay here that we are a real backpackers, not a hostel trying to be a hotel. We concentrate the most of your experience here in Sayulita, we are not trying to sell you tours, services and get you wasted. We want to meet cool people and go to the beach, that's why we exist. We built a hostel from the ground up, affordable for Backpackers and Travelers. 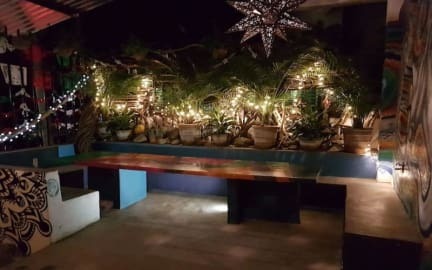 Over the last two years, the prices in Sayulita have gone up so we built a hostel to keep the price low, officially offering the lowest price in Sayulita. The Hostel boasts an all-new dorm formerly a ballet studio with brand new beds, luxury mattresses and fresh sheets with huge lockers. Downstairs there is a large lounge set up with newly built reception bar area. Upstairs we have a chill lounge kitchen set up get away from the bustle of the hostel. We boast the largest and newest bathrooms of any hostel in Sayulita. We have 10 hot showers in our brand new bathroom set up. Our hostel plays a large part in the community. Message us about our current environmental and school projects in the area. We are located in one of the most beautiful areas of Mexico, right in front of the ocean and beach. From our facilities, you can reach the beach in some minutes walking as well as other important spots of Saluyita such as Sayulita Plaza and different restaurants that will offer you the best of Saluyita and Mexico. In addition, another beautiful city of the area as Puerto Vallarta is one hour away by car. The hostel is built like a fortress with 24-hour cameras which will give traveler's great comfort. Each bed comes with a light and plug. Sayulita has become one of the top destinations in Mexico, so being situated 40 seconds from the main bus stop in town is perfect. On one of the nicest and quietest residential streets in all of Sayulita. Check out before 12: 00. No curfew. 10 pm no music. No smoking in the main dorm. All staff are volunteers and some guests are working with the hostel as part of many projects we develop in Sayulita, Currently, we work with the Turtle camp, Assisting a local Child Neurologist, Beach Clean team, Helping out at the local vet Sayulita Animals and helping locals out with problems. Some volunteers do not speak Spanish. Some don't even speak English. But we always make it work. Check-in time is 8 AM - 8 PM. Upon check-in, guests will receive a key/key code for access to both the hostel entrance and the room, there is a $200 peso security deposit. If you lose your key, we charge a $200 peso replacement fee. The comfort, safety, and security of our guests are of paramount importance to us and guests are expected to respect other guests, staff, and the property. Any guest(s) who compromises the comfort, safety or security of other guests, staff or local residents will be asked to leave and will not be offered a refund. Guests will be charged for any damage caused during their stay. The kitchen is managed by the guests. You clean your own dishes and utensils after you use them. Guests leaving dishes and dirty pans to stack up will be notified of the charge for cleaning. Smoking is allowed upstairs on the premise except inside the main dorm. Drug use is illegal in Mexico. Any guest found using drugs within the building will be asked to leave the premises immediately and will not be offered a refund. We do allow outside alcohol on the premises. Excessive drinking will not be tolerated. Secure lockers are located inside the main dorm. It is your responsibility to ensure that all of your things are secure at all times, Cult Wild Backpacker Hostel accepts no liability for the loss, theft or damage to your property, however, sustained or caused. We strongly recommend you bring a padlock to use with your luggage & backpack. Cult was amazing to stay at. Honestly I would of stayed there alot longer if I didn't have to meet my sister. I can understand why some people might say it's too hot at night but it doesn't stay hot all night, it not that bad. And the people who volunteer and stay at cult are the best type of people. It's not a question of if I would stay there again it's when. Take care cult. The hostel is the best place to stay in Sayulita. The volunteers at Cult Wild are very friendly and organized. The hostel is just outside the downtown making for quiet time. There is always events planned through the hostel and it provides you a great way to meet new people. I have nothing but great things to say about Cult Wild Hostel. Friendly, clean, and quiet. So good! Absolute bunch of legends in a legendary location. Really well managed hostel with everything you need and a good vibe. Thanks!! The stay was actually good, it was so confy except for the fact there was no water at the shower and toilet. I was said there was no water because of a problem at Sayulita but i asked more people if the had water at their hostel because of the problem and they said there was no problem. So, for having water at the hostel there were some huge buckets of water refill where you could grab some. Cold showers, not much space and dirty and super hot room with really poor facilities. Very dirty. Facilities would be great if it wasn’t for the cleaning situation. There was no water throughout our stay. Staff blamed water distribution, but other places in town seemed to have water just fine. 3 days without water (for drinking, cooking, toilets, everything). The room is fine, quite silent, despite having 42 beds. Otherwise, quite alright for a short budget stay. My stay at this hostel was rough. The place is dark, dingy and HOT. The common spaces are covered in dog hair and are not welcoming. The upstairs kitchen - while a nice addition - feels much the same. Not really a place you want to consume food in, especially because it's right next to all of the bathrooms and showers. 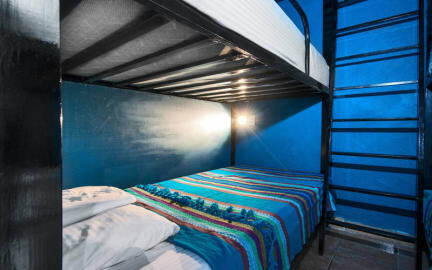 It seems like this hostel is never cleaned - one look underneath the beds and you'll be able to see that for yourself. Spend a LITTLE more on a slightly better place, please. Loved the staff for the most part. But it’s hot at night and dirty, and while I was there very loud, yes after 10pm. There’s nowhere comfy to chill out unless you want to be stuck in your bed. I paid for four days but could only stick it out for two because it was so uncomfortable I wanted to crawl out of my skin. I can see how it could be nice for a specific purpose, a quick place to sleep, they do have cool activities set up through the week too. It just wasn’t for me.